Whether you are currently serving as a Police Officer, have served in the past, or just want to show your love and admiration of those who risk their lives for our safety, you and your dog will be wagging your tails for this design! Inspired by The American, American Bones, and American Stars, we present to you, Thin Blue Line. This necklace was designed to thank those in uniform- our heroes in blue! Here at W�lf Grace, we wanted to show recognition of our hard working, dedicated Police Officers. 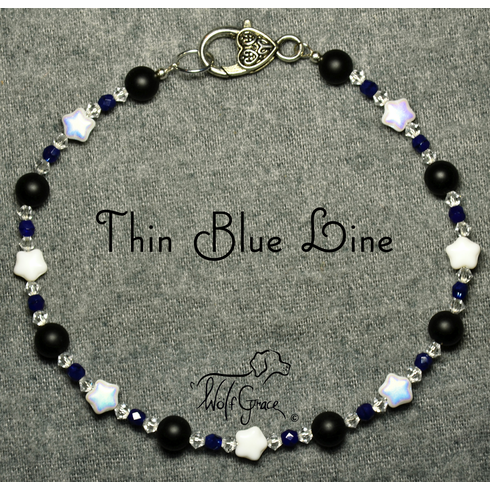 You�ll be reminded of the "Thin Blue Line Flag" when you see the 8mm Chalk White Star beads with a Chalk White finish on one side and an Iridescent/AB finish on the other side (differences exhibited in photos). With a tasteful bled of 8mm Round Matte Black Agate Beads, alongside the sparkling 4mm Round Crystal Clear Preciosa Bicone Beads. Shining at the center of it all, the 4mm Round Czech Ink Czech Fire Polished Glass beads, which represent the Thin Blue Line of the Police flag; the line between chaos and order. So the beads stay strong and shining for all the times to come, as with all of our necklaces, these beads are strung on Sterling Silver jewelry-grade wire. Notice on each end of the necklace, how the Sterling Silver crimp covers reinforce and conceal the Sterling Silver crimps, which hold the beads securely in place. 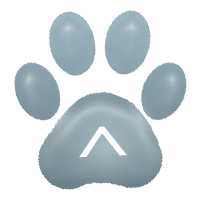 W�lf Grace personally extends a huge thank you to those in blue.